A rare medium-sized black hole known as NGC 2276-3c could be the “missing link” in the development of exotic bodies astronomers have been seeking for decades. A jet seen emanating from the object also seems to be snuffing out star formation in its neighborhood. The black hole sits within the galaxy NGC 2276, roughly 100 million light years from Earth. With the help of observational data gathered from NASA’s Chandra X-ray Observatory and the ESA’s Very Long Baseline Interferometry (VLBI) Network, which is used to detect radio waves given off by energetic sources within the cosmos, the team of researchers, led by astrophysicist Mar Mezcua of the Harvard-Smithsonian Center, determined that this ‘intermediate-mass black hole’ (IMBH) is actively developing a so-called ‘dead zone’. 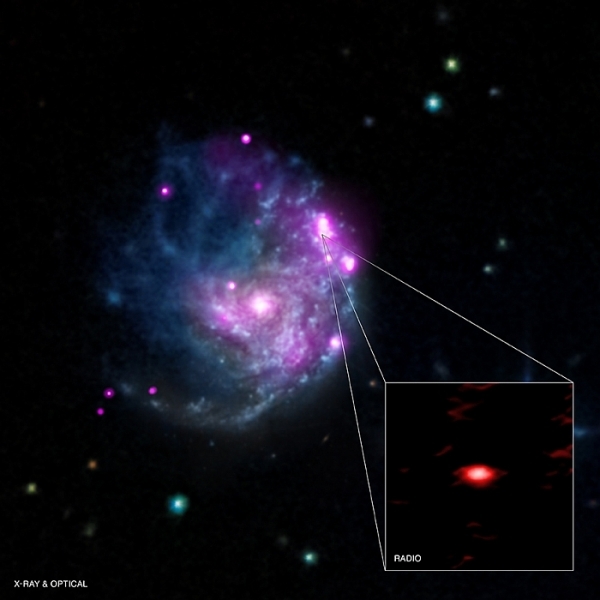 A rare intermediate-mass black hole has been discovered in the galaxy NGC-2276. Why don’t astronomers see more of these exotic bodies? Black holes are known to come into two main classes: stellar-mass black holes that are around 5-30 times the mass of the Sun, and supermassive black holes, which are found at the center of most galaxies and weigh millions or even billions times the Sun’s mass. And as their name suggests, IMBHs fall in between these two classes, with masses ranging from a few hundred to a few hundred thousand solar masses. Now, researchers have possibly identified one such IMBH (NGC 2276-3c) with a mass of about 50,000 times that of the Sun. This discovery could possibly answer some longstanding questions about how black holes evolve and grow over time. But this bright object, known as NGC-2276-3c, has a dark side. Blasting up to 2,000 light-years from the black hole, a powerful radio jet penetrates through the galaxy’s interstellar medium. Within this jet, up to 1,000 light-years from the black hole, there is a dramatic paucity of young stars; the jet appears to have cleared a cavity near the black hole, removing star-forming gases, snuffing out star birth. The researchers are now trying to understand how the IMBH got there in the first place. It seems highly probable that NGC-2276-3c formed in the core of a smaller dwarf galaxy that, hundreds of millions or billions of years ago, merged with NGC 2276.